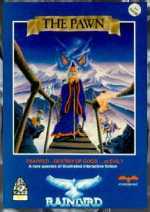 Definitely one of the "Finest Hours" of the British interactive fiction scene, Magnetic Scrolls' first release The Pawn was an instant sensation in Europe when it was first released, and instantly earned its the developer the moniker of "Europe's Infocom." The PC version, not surprisingly, fared much worse than the Commodore and Amiga version due to inferior graphics and almost nonexistent music. The game is off to a good start with an imaginative fantasy plot. After being knocked out on the way home from the market, you awake in the magical land of Kerovnia, with a silver band clasped around your wrist that cannot be removed. Your goal is to escape Kerovnia, where a general election is about to be held to decide whether King Erik will continue to reign. A dwarf, whose campaign pledge is to "rid dungeons of mazes of any sort" is running against the King. Other locals you'll meet are Kronos the Magician, a Guru on a hill, and a Dragon, all of whom are very well-written and memorable in his or her unique way. If you've never heard of Magnetic Scrolls, or a parser that not only rivals but surpasses Infocom's in many respects, you are in for a pleasant surprise with The Pawn. With a 3,500-word vocabulary, it understands adjectives, pronouns, and two interpretations of the conjunction (instead of just one as with most parsers). How many games could handle this sentence: "Get all except the cases but not the violin case then kill the man-eating shrew with the contents of the violin case."? The parser outdoes Infocom's in the number of multiple commands it can deal with in one go: 32. But even the world's smartest parser is just a bunch of bits and bytes unless it's put to work inside a good game, and fortunately, The Pawn delivers in spades. The game wraps a well-honed prose, great graphics (even though they are grainy in the PC version), and scores of puzzles - some diabolically difficult, others deceptively simple - in a fun story that unfolds as you progress (you won't learn the significance of the game's title until later in the game). Most puzzles are object-oriented, and there are dozens of things to juggle while figuring out how and where to use them. If you get stuck, the game's on-line hint feature doles out graduated hints, similar to Infocom's Invisiclues hintbooks. Purists who don't want graphics to get in the way of their imagination can turn them off, to no detriment to gameplay, since most scenes are described in great detail, ofen with a wry sense of British humor. It even included a thick, well-written novella "Tales of Kerovnia" that sets the stage to the game. In 2017, a Remastered version was released by Strand Games adapted for modern PCs and mobiles, with a vastly improved UI. Features include: Touch-Text Commands; Tap "links" in the text to perform commands without typing; Game specific word suggestion; Tap suggested words from the word bar during input to save time; Sidebar Inventory; All your things are conveniently listed in a sidebar - Drag and drop to use them or to apply them to things in the main text; Dynamic Map - No need to draw out the map, we do it for you. As you explore the game, the map page will expand. Tap any previous room on the map to "fast-goto" that location; Quickly navigate with a handy compass gadget. It shows the available exits at all times, simply tap to move. The new facilities make the original game fun and entertaining to play on modern devices. No more dead ends; the remaster has multi-level undo, save/load game and automatic undo from dying. There's also the original artwork, the animated artwork and new music from the original artist John Molloy.